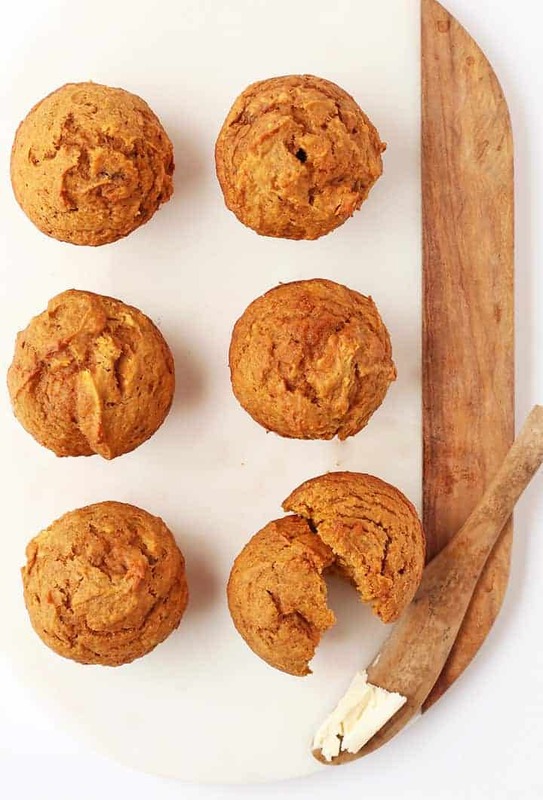 Fall into fall with these deliciously light and perfectly flavored vegan pumpkin muffins. An easy, fail-proof, autumnal pastry that will warm up your home and fill up your belly. Made in just 30 minutes! Not only is today one of my favorite days of the year because, yay, OCTOBER, but ALSO it is the day I celebrate my veganversary. 12 years and counting! Which, this year, means that 1/3 of my life I have been living and eating (and thriving and flourishing) as a vegan. To celebrate the beginning of October and my veganversary, I made a little sweet treat. Vegan Pumpkin Muffins, to be exact. 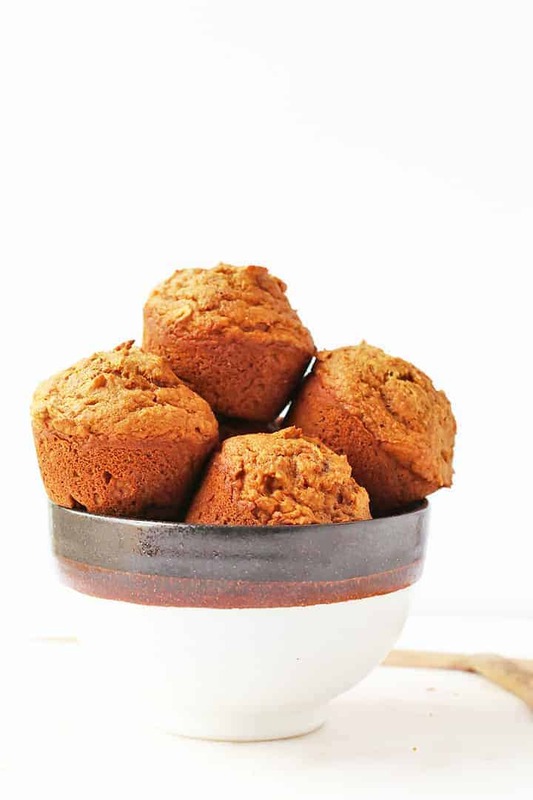 These pumpkin muffins are a variation of last year’s Vegan Cheesecake Muffins. 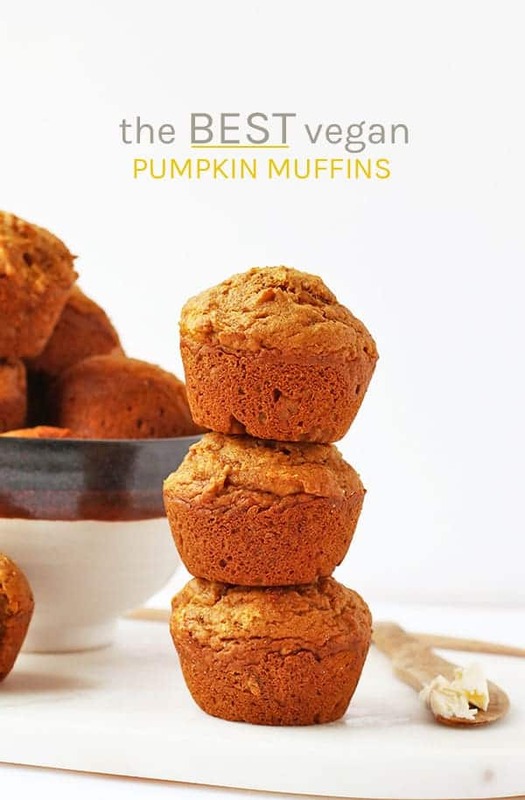 Since sharing those on the blog, I have had several requests for a plain and simple vegan pumpkin muffin recipe. 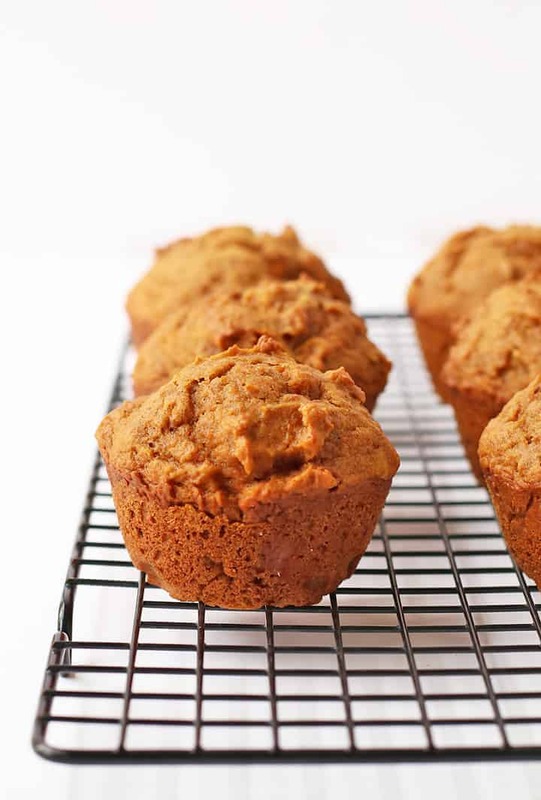 And so, per your request, a warm, light and fluffy, pumpkin muffin that is bursting with pumpkin flavor and fall spices. 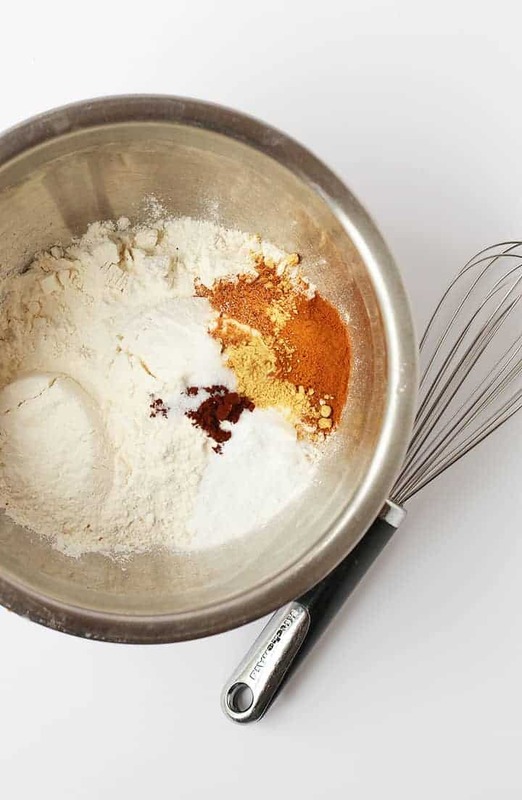 Whisk together all your dry ingredients in a bowl. That’s your flour, baking soda, salt, and spices. In a separate bowl (or liquid measuring cup) mix together your wet ingredients. That’s pumpkin purée, sugars, apple sauce, coconut oil, and vanilla extract. Combine the wet ingredients with the dry, mixing until you have a uniform batter. Don’t over-mix as this will make your muffins dense and gummy. Scoop the batter into a prepared muffin tin and bake for 20 minutes at 350 F. To check for doneness, insert a toothpick in the middle of a muffin. The muffins are done when the toothpick comes out clean. Pull from oven and let the vegan muffins cool for 10 minutes in the muffin tin before transfering them to a wire cooling rack. If you flip them out too quickly, the muffins may fall apart. Make sure not to over-mix your batter. When the batter is over-mixed, it allows gluten stands to form which leads to gummy dense pastries. We’re looking for light and fluffy! Spray your muffin tin well! Or, if you’d prefer, use cupcake holders. This will prevent the batter from sticking to the pan. Fill up your muffin molds about 2/3rds of the way full. If you do much more, the muffins will spill over as they rise. Let your muffins cool for 10 minutes before flipping them out onto a wire cooling rack. Let muffins cool completely before storing them. They should be stored in an airtight container at room temperature for up to 5 days. The muffins can also be frozen and pulled out to thaw the night before. The perfect morning pastry to have with your morning chai latte. And to celebrate this wonderful October day, I’ve got a few more recipes you might like. So let’s get our pumpkin baking on! 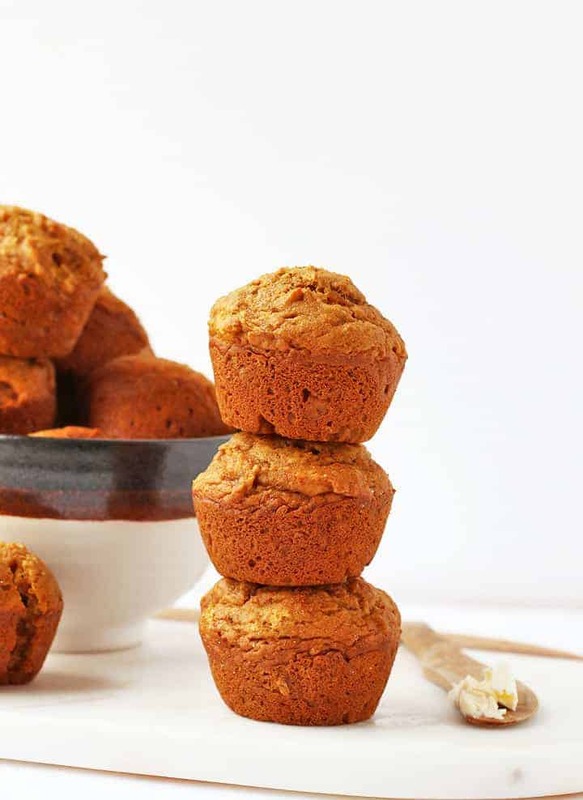 Fall into fall with these deliciously moist and perfectly flavored vegan pumpkin muffins. An easy fall pastry that will warm up your home. 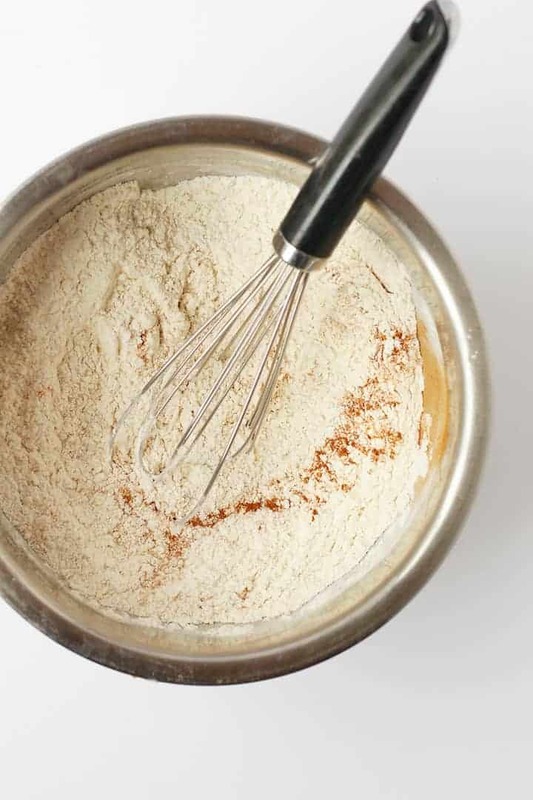 In a small bowl whisk together flour, baking soda, spices, and salt. 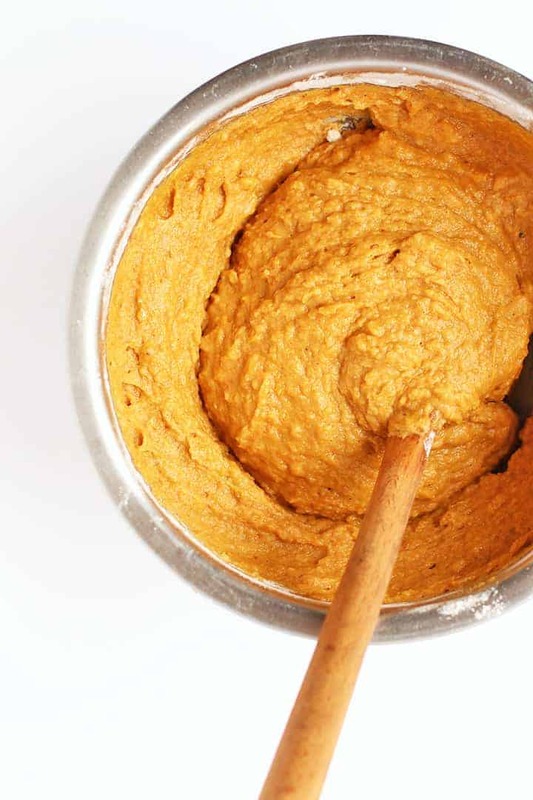 In a large bowl combine pumpkin puree with both sugars, mixing to combine. Add apple sauce, oil, and vanilla extract and stir until smooth. 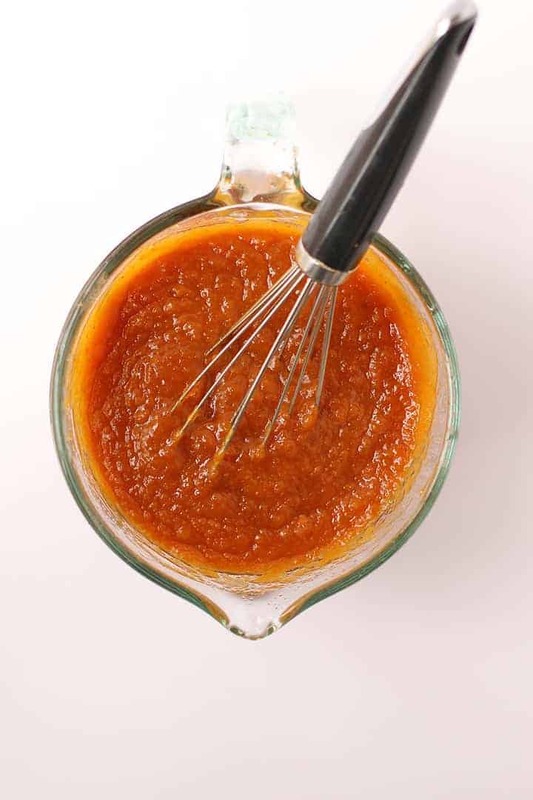 Fold dry ingredients into the wet ingredients until a uniform batter has formed. Be careful not to over-mix. Fill muffin molds 2/3 of the way full. Bake for 20 minutes or until a knife inserted in the middle comes out clean. Remove from oven and allow muffins to cool for 10 minutes before transferring to a wire cooling rack to cool completely. To top the muffins, combine the cinnamon and sugar in a small bowl. Melt the butter in the microwave or on the stovetop. Lightly brush each top with melted butter and sprinkle with cinnamon and sugar. Serve immediately or store in an airtight container at room temperature for up to 5 days. It definitely sounds like something went wrong! Perhaps your baking soda was expired? I Made the pumpkins muffins yesterday and they were elicious. I could not stop eating them. Thanks for a great recipe. Is it just me? I made this twice now, it’s great, but made way more than 12! How many is it making for you? I had some leftover pumpkin puree & came across this recipe. I thought I’d give it a go, not really sure about how they’d taste since I’d never had pumpkin muffins before. I didn’t have apple sauce so I substituted 1 mashed banana for it. I used grapeseed oil instead of coconut oil & used raw organic sugar. They only took about 18 minutes to cook with a preheated oven. My son & daughter were very skeptical because the name didn’t sound very appealing but when they tried them they were both pleasantly surprised at how delicious they were! These were a real winner with the whole family & I will definitely be making them again. So glad you gave it a try! Thanks for sharing. These are amazing muffins! I used coconut sugar instead of white sugar and added raisins. Made 16 muffins, baked for 25 minutes.